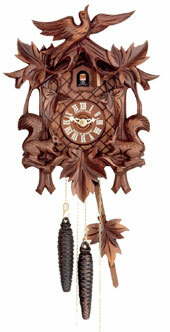 14 inch cuckoo clock with an unusual contemporary design. Cuckoo calls half and full hour. 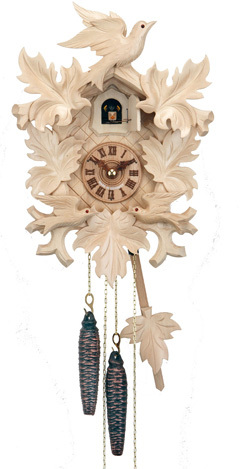 13 inch cuckoo clock with 1 day movement. Very elaborate carvings, natural wood, no stain by Hubert Herr. 10 inch 1 day carved cuckoo clock with beautiful handpainted yellow roses and moving birds. Clock also features wooden dial and german brass rackstrike movement with nightshutoff. 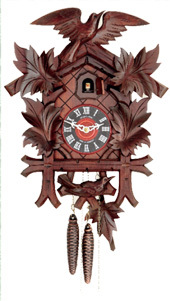 This traditional style 1 day carved cuckoo clock is made by Hekas out of linden wood and stained in walnut color. 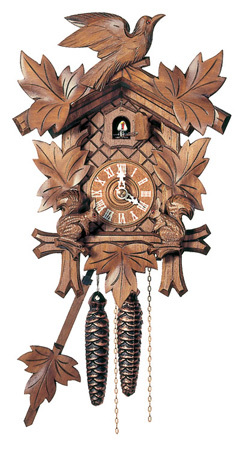 Cuckoo clock by Hubert Herr with 1 day movement , hand carved leaves and birds, wooden dial and solid wood case. Cute 9 1/2 inch 1 day cuckoo clock with handpainted flowers. Nicely carved bird and leaves. 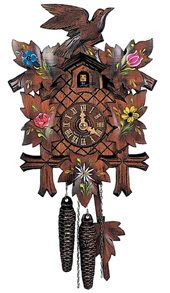 Clock features handpainted Edelweiss flowers, wooden dial and wooden cuckoo bird. 14 inch 1 day carved cuckoo clock with handpainted alpine flowers. Clock also features wooden carved hands (a Herr exclusive), wooden numerals, wooden cuckoobird and dial. Clock has nightshutoff.